Over the course of six months in 2015, the author of this paper conducted a qualitative study of high school students who participate in Beyond the Bell’s CyberPatriot program, and their parents. CyberPatriot is an after-school program founded by the Air Force Association to inspire high school, middle school, and elementary students toward careers in cybersecurity or other science, technology, engineering, and math (STEM) disciplines. Students work in teams to compete in cybersecurity competitions at the local, regional and national level. 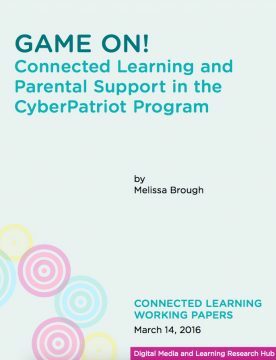 The aim of this study was to help identify factors that affect students’ interest-driven learning and their participation in the CyberPatriot program, especially those factors related to home life and parental influence. Students were recruited from CyberPatriot programs at six high schools in the Los Angeles Unified School District as well as from three regional CyberPatriot events. A total of 12 families participated in the study. Students and their parents completed in-depth, semi-structured interviews typically taking place in their home. The families in this study represented a range of socioeconomic and educational levels and race/ethnicities. The majority reported an annual household income of under $49,000. This report provides an analysis of the data collected from the families, as well as four case studies of particular students and their parents in order to offer a more in-depth picture of some of the emergent themes.